I’ve been on a quilting hiatus. We are selling our Somerville house and have already moved into a 3 bedroom apartment. 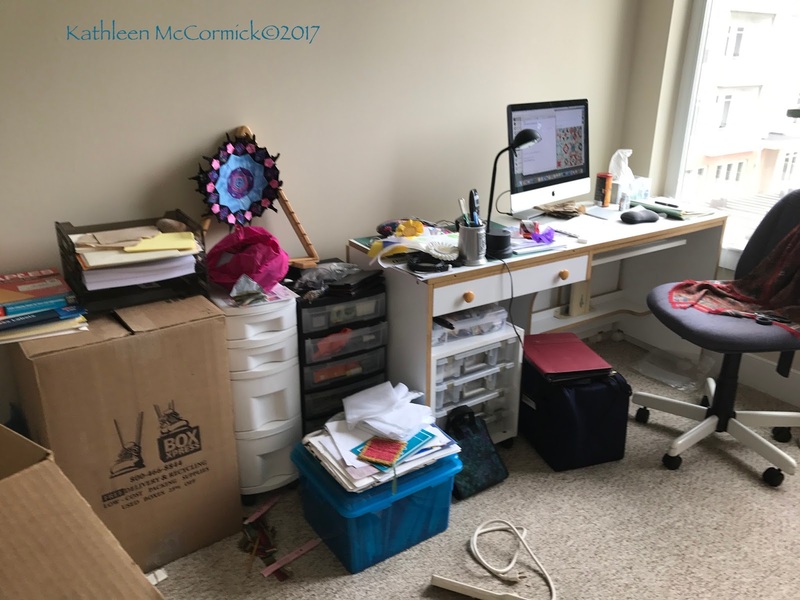 Here’s what my sewing room looked like 15 days ago (I have since set up my machine where the computer is). Before it is really done, two cabinets will come from the house, which probably won’t happen until late October. Note the scissors on the chair – not ready for sitting in! 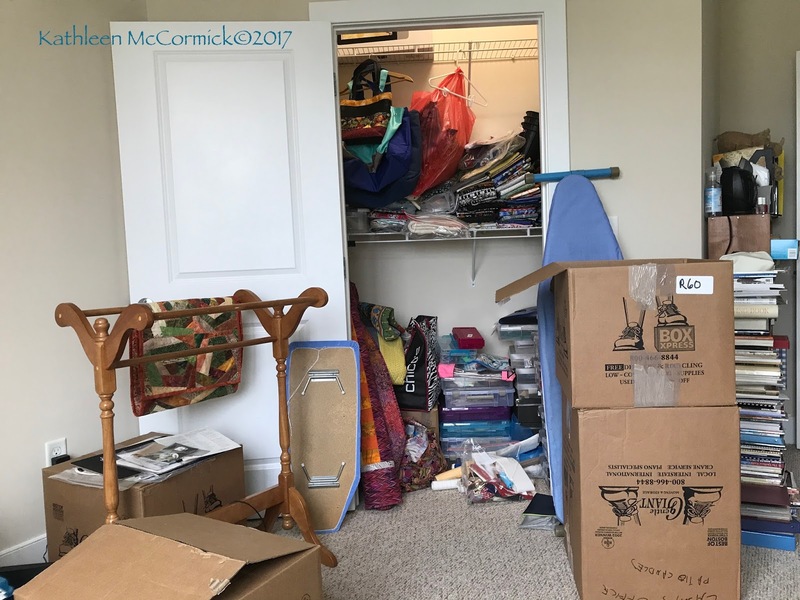 You can see there are quite a few projects in plastic storage containers, fabric is on shelf – not organized. But, we were planning on spending much of August in Maine, before the move was to happen. We found a place we liked and as there are few 3 bedroom apartments, we jumped on it a bit early. The good thing was it got the process going. The bad thing was, it was earlier than I envisioned! So, we moved contents and left some furniture to make it all work for the showing, but that furniture includes two storage units for fabric and files. However, here comes the good news: I put together a quilt top – oneof my UFOs for 2017. So fast, and as I type this, I am planning to sandwich today as another border is already on, but I really wanted to get a blog entry on this quilt. 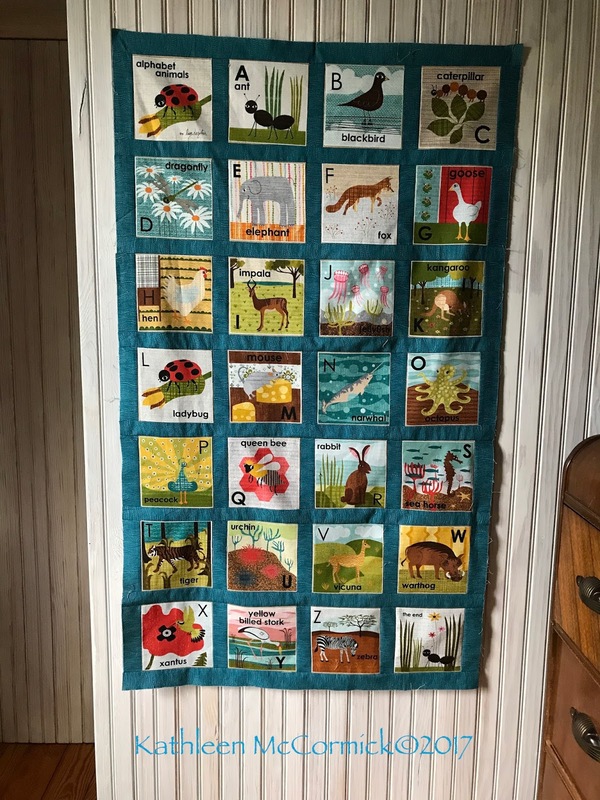 Previous Post Pets on Quilts 2017! I hope that the moving process works out for you in the end, Kathleen. Way to go getting a WIP worked on and I hope you enjoy the finishing process! Thanks, Yvonne. I am enjoying the finishing process, quilting on my Janome in Maine. One more day and it might be done! I believe the move will work out; a good time for us to do this. Thanks, Andrea. I am less scared about the move than I was, but worried about the emotional piece when we sell our house of 22 years! I'm glad to see you worked some sewing time around the move; once your settled I'm sure you're going to love your new studio. I'm quite envious of your window since I sew in the basement and the view is not so great. I really like the alphabet panel. Thanks, Rose! I am glad, too, to get some sewing time in. Back to reality tomorrow as we return and check in on what our son has accomplished while we are gone. His organizational skills are a bit lacking. The move seems to be going well so far, and man! A finished UFO. I'd be crowing with pride if it were me! Thanks for linking up to Wednesday Wait Loss. Best wishes for your move and sale of your home. And you got a top put together?! That's what keeps us going!!! Great job! Truth be told, it was pretty simple. But, yes, sewing does keep us going! Good Luck with the move! Glad you can still sew a little! Thanks, Paige. I obviously got distracted and missed responding. I am glad to be sewing – it means getting back to normal, well, the new normal! Having just moved and downsized ourselfves, I do NOT envy you that confusion and stress of now WHERE should I put that? and then… Now WHERE DID I put that? lol. Nice to get a UFO on the go right! You are so right! Today’s question – where are the toothpicks?